Chill, chill, chill perhaps play a few tunes on the guitar while enjoying your bear or perhaps a glass of vine on the balcony with your new friends or fellow travelers. Ladybird is the Heart and Soul of Beach Hostel. She is a Norwegian Artist Lady who left everything on a hunch and a feeling in 2009. Split and Beach Hostel has been her Life sins. She speaks fluently Norwegian and English. 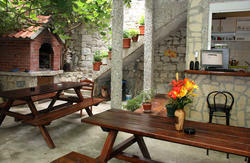 She is an experienced backpacker and offer advice on Split & all of Croatia. We have a Common Room with Guest Computer, TV, DVDs and Book exchange. Ladybird’s, and the Guest's Very Cool Art decor is covering the walls. We have a lot of fun but discourage groups of irresponsible drinkers. If you need quiet night at home, the party leaves the house latest at 23:00 o’clock due to city noise restriction laws. * Please include an approximate arrival time. * Check-in: 13:00 (1:00 PM). 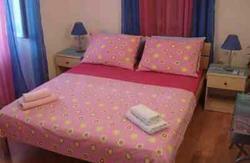 * Tourist tax of 7kn per person per night is not included in the price. * We do not accept credit cards. Payment must be in Croatian kuna. ** Print the map and directions. 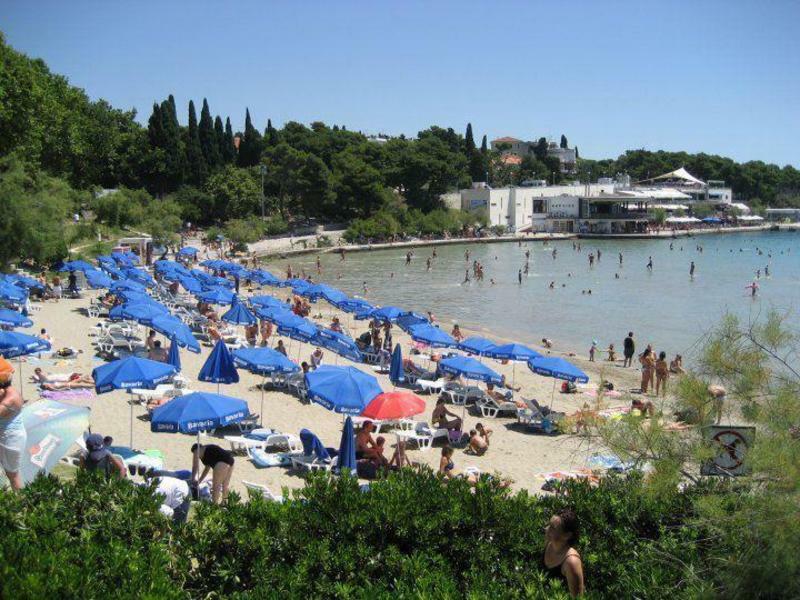 ** We are at Viska 9, Bacvice Beach, 70 meters directly above the side entrance to the Hotel Park (note: Hotel Park has 2 side entrances). BUS STATION: If you are standing outside the bus station ticket office, facing the water and port, walk towards your left hand side (away from Old Town and Diocletian's Palace). This is Domagojeva Obala street (sometimes called Obala Kneza Domagoja). Walk straight and up a slight incline. (You will see railway tracks on your left hand side). At the top of the incline you will see the sea. Cross the street and turn left. Take a few steps, then walk toward your right hand side and follow the path along the sea. Continue walking along the path with the sea to your right hand side. This is Preradovicevo Setaliste (also called Setaliste Petra Preradovica). Keep walking along the path with the water view. Walk past the Hotel Park which will be on your left hand side. After the Hotel Park, continue walking along the sea view. Walk 50 meters and turn left at the second street, Viska (be careful there are no street signs indicating Viska. The first street is a small one way street, & the second street is Viska). We are at Viska 9 (pink building). TRAIN STATION: Train station is directly behind the bus station. Follow directions above from the bus station to the hostel. FERRY PORT: Ferry port is located immediately across the street from the bus station. Follow directions above from the bus station to the hostel. 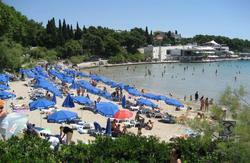 AIRPORT: Take the Croatia Airlines bus or another shuttle bus company from the airport to the Split center (about 30 kn). You can ride even if you arrived with a different air carrier. Ask the Croatia Airlines desk at the airport when the next bus is leaving to the Split center. The bus drops off passengers at a drop-off near Diocletian's Palace/'Riva' (Boardwalk). Walk 200 meters to the main bus station. Follow directions above from the bus station to the hostel. ** No need to take taxis. We are a short 7 minute walk from the train, bus, ferry, and airport shuttle bus drop-off point to the hostel. ** Ask for the Hotel Park if you get lost at any time. We are located 70 meters directly above the SIDE ENTRANCE TO THE HOTEL PARK (note: there are 2 side entrances to the Hotel Park).